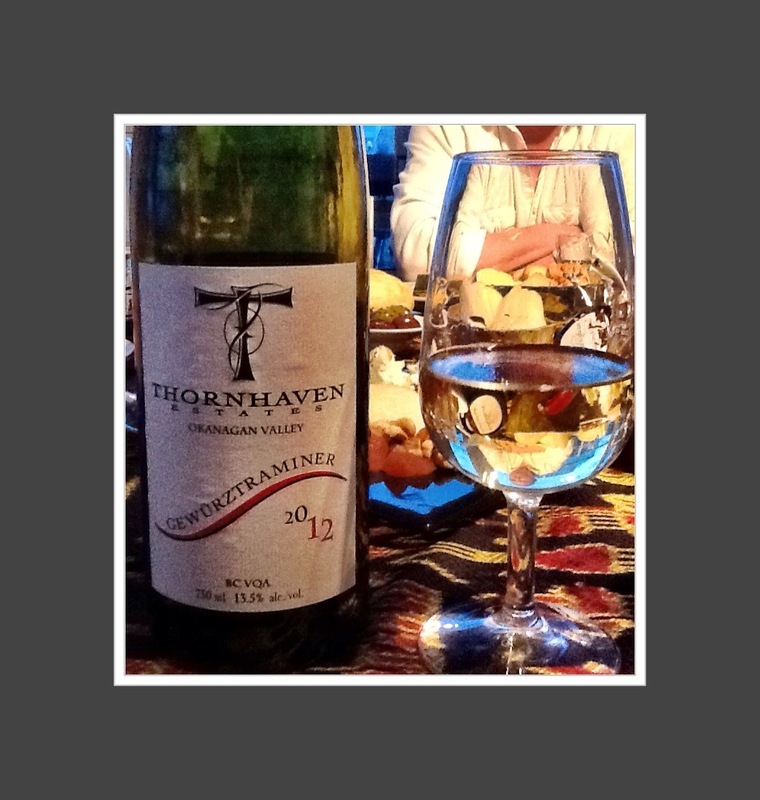 Thornhaven Estates, Gewürztraminer, Summerland, Okanagan Valley, BC, Canada, 2012, 13.5% abv. Did you know? Gewürztraminer shares the same genetic footprint as several other white grapes including Savagnin, Paien (Switzerland), Traminer (Germany) and Traminer Aromatico (Trentino-Alto Adige, Italy). It’s an aromatic grape that is thought to be a mutation of the Savagnin Rose (grown mostly in Alsace). The first part of its name – Gewürz- means spice and it has interesting grapes that are a pure pink colour by the time harvest rolls around. Classic Gewürztraminer are full bodied, deeply golden and even have a little copper to them. These wines can be as high as 14% abv but also have low acidity and aromas and flavours of lychee, rose petals and sometimes a bit of a soapy character. Bitter when picked a little early, late picked wines can even develop secondary flavours similar to bacon. There are about 261 ha planted in BC and this one comes from Thornhaven Estates in Summerland. It is clear and bright, pale gold with legs. The nose is clean and youthful with pronounced intensity with aromas of roses and blossoms, honey, lychee, grapes and pear. The palate is dry with medium acidity and medium body, medium plus alcohol and medium plus intensity with the same flavours of roses and flowers, clover honey, pear, lychee and stone fruit. The finish is medium. This is WSET Good; it’s got low acidity and higher than average alcohol, but the flavours and aromas are nicely concentrated and typical of this variety. A perfect wine for sushi and a westcoast Canadian summer evening. This entry was posted in BC, British Columbia, Gewurztraminer, WHITE and tagged BC, british columbia, Gewürztraminer, Okanagan Valley, Summerland, Thornhaven Estates, VQA, What is Gewürztraminer, white wine, WSET Light Wines of the World. Bookmark the permalink.